For Mortimer, Merlin, and Bryn, it seems the fates have already written the ends of their stories. 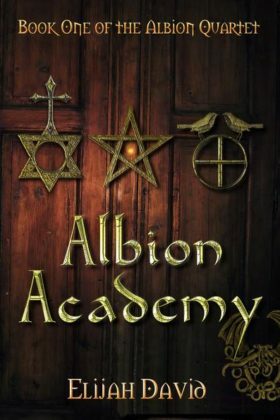 When Mortimer asks unorthodox questions, the Djinni Elders exile him to a human school of magic—Albion Academy. Merlin’s friendship with a mortal only increases his mother’s determination for him to live up to the heritage of his ancestors. And Bryn’s prophetic sisters outright declare that her fate is tethered to Mortimer, Merlin, and the mysterious door in the school’s basement. As the three of them struggle against the constraints of their families’ expectations, they find themselves inexorably drawn into a conflict that encompasses rogue Faeries, dangerous mortals, and sorcerers hidden in Albion Academy itself. Defying their fates might be the only way they survive their first year at . . .
Book 1 of the Albion Quartet series.